Mindo Robot: This single player thinking game is easy to learn, but can be graded to be a challenge for ALL ages and skill levels. 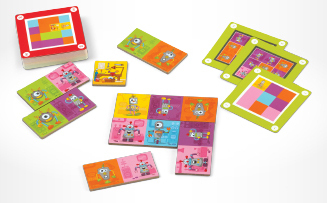 You are given a challenge card that shows only a color pattern and where a Robbie the Robot MUST be when done. Then the rules are simple: turn and flip the 9 double-sided, 2 colored tiles until you have recreated the challenge card. They only fit one way into a 3x3 or 4x4 grid. Sounds easy enough... but pay attention to details, plan carefully and begin again, if and when needed. 60 different challenge cards and 4 levels of difficulty ensure hours of brain teasing fun!